One of the most creative Israeli-Palestinian coexistence initiatives has taken root on the beaches of Tel Aviv and Gaza City. Since September of this year, Israel has faced an unprecedented wave of lone wolf stabbing and shooting attacks, further exacerbating the atmosphere of violence and mistrust between Israelis and Palestinians. But a small group of Israeli surfers remains undeterred, and are focusing on improving ties with their Palestinian counterparts in both Gaza and the West Bank through an innovative and groundbreaking initiative called Surfing 4 Peace. Since its establishment in 2007, Surfing 4 Peace has provided surfing equipment to residents of the Gaza Strip in an effort to bridge cultural and political barriers. 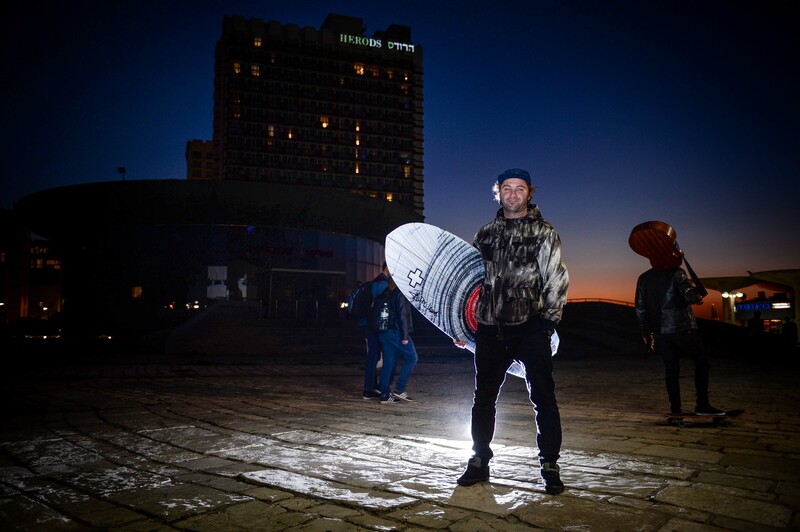 Initially established as a cultural bridge between Tel Aviv and Gaza, the initiative has blossomed into an international network of surfers from an array of ethnic and religious backgrounds. At the helm of Surfing 4 Peace is Arthur Rashkovan, an Israeli surfing legend based in northern Tel Aviv. Affectionately known as Dr. Surf, his laid-back personality and sunny disposition seem more suited to Southern California than the Middle East. Born and raised by Tel Aviv’s famed Hilton Beach, Arthur is the embodiment of the city’s seaside culture. “The surf scene was blowing up at Hilton Beach in the late 1980s. It felt like a mini-Venice Beach, and I was naturally brought up in that culture,” he explains. “As a teenager it was a real conflict between my passion for surfing and my duty to my country.” At 17, with his father’s permission, Arthur accepted an invitation to become a counselor at the Paskowitz Surf Camp in San Clemente, California. Despite enjoying his time in California, Arthur felt his place was in Israel and returned home to serve in the Israel Defense Forces. “I didn’t have a lot of glorious jobs in the army, because I was always getting injured skating and surfing, but it was important for me to be home and do my duty,” he recalls. By age 23, Arthur was director of the Israel Surfing Association, a platform he used not only to promote the sport in Israel, but to play a larger role in the country’s civil society. “The highlights of my career have always been on the activist side. At the same time, Israel has always been detached from the surfing world and all I’ve been trying to do is put us on the map,” he says. It was a chance encounter with Dorian “Doc” Paskowitz—founder of Paskowitz Surf Camp—on Tel Aviv’s boardwalk in the late 1990s that would change Arthur’s career forever. “Surfing in Israel is synonymous with the Paskowitz name, and Israeli surfing was one of Doc’s most important babies. 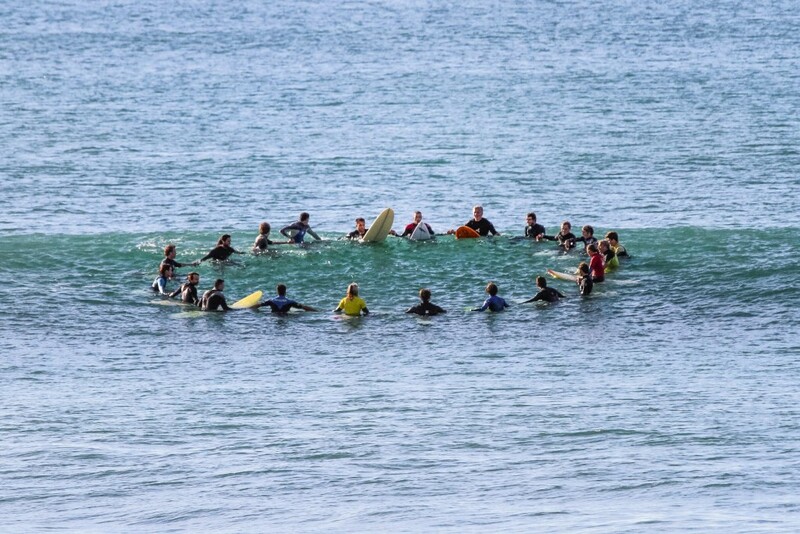 We quickly formed a very special bond beyond surfing itself,” explains Arthur. A Stanford-educated doctor who grew up in Texas, California, and Hawaii, Paskowitz was directly responsible for the sport’s rise in Israel. In 1956, in the wake of the Suez crisis, Doc gave up most of his belongings and traveled to Israel to volunteer for the IDF. After being rejected from the military for medical reasons, he took his surfboard—one of the few possessions to make the trip with him—to Tel Aviv’s boardless beaches. Watching in astonishment as Doc surfed was a group of lifeguards, who would soon become Doc’s first Middle Eastern disciples. In a 2014 New York Times obituary, Moses, one of Doc’s nine sons, explained, “Dad was this friendly, herculean guy who loved surfing, so he fit right in. He said, ‘First I’m a surfer, then a Jew.’” Surfing, often considered a tribalistic sport by enthusiasts and academics alike, was something Doc believed could help bridge the gap between Israelis and Palestinians. 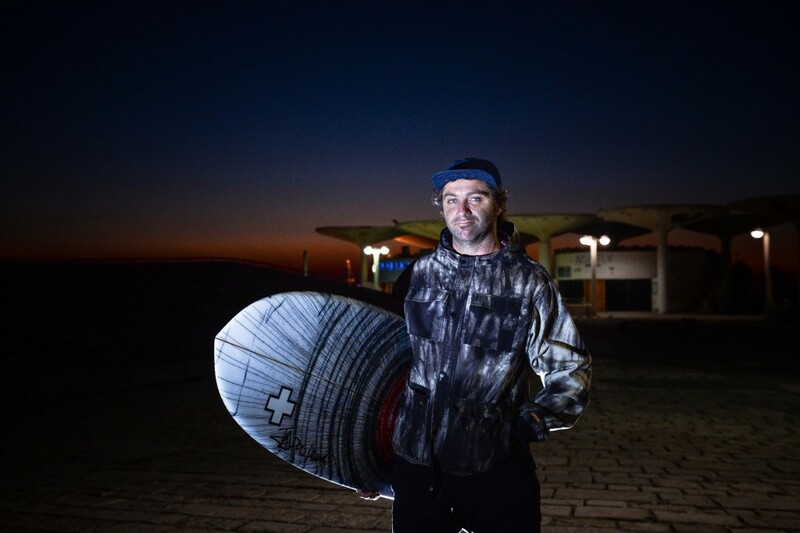 After spending several years helping Arthur promote Israel’s surfing scene overseas, Doc returned to Israel in 2004 and asked Arthur to introduce him to some local Israeli-Arab surfers in an effort to forge ties with the surfing community in Jaffa. Shortly thereafter, Doc donated boards and equipment to the first surf contest for Israeli-Arabs, which took place later that year. For the next two and a half years, Doc and Arthur helped Jaffa’s Israeli-Arab surfing community through a series of ad hoc clinics. It was in 2007 that their project evolved beyond anything they thought possible. Following a monumental power struggle between Hamas and Fatah in the Gaza Strip, Los Angeles Times staff writer Louise Roug traveled to Gaza City to document the political transition taking place. In a July 29 article, she interviewed several Gazan surfers about the mental escape offered by surfing in such a conflict-ridden place. The article caught the attention of not only Arthur and Doc, but also international surfing legend Kelly Slater, an American of Syrian descent. Shortly thereafter, the trio, alongside Doc’s son David, established Surfing 4 Peace. Within weeks of the LA Times article, the newly minted organization gathered 14 used surfboards from Israeli companies and donated them to Gaza’s surf community with the help of the international NGO One Voice. The official handover of the boards at the Erez Border Crossing was heavily covered by the international press. Doc, by then 87 years old, was photographed walking across the border, surfboard in hand. Several months after the handover, Surfing 4 Peace organized a large-scale concert in Tel Aviv in order to raise awareness in the international surfing community. With over 3,000 people in attendance, the event kicked off at Dolphinarium Beach with a ceremonial paddle-out to sea by several members of the Paskowitz family, as well as Kelly Slater, Arthur Rashkovan, and famed Hawaiian surfer Makua Rothman. While the Paskowitz group in Tel Aviv was raising awareness of the project in Israel, the LA Times article also struck a chord with two American surfers, Seweryn “Sev” Sztalkoper and Matt Olsen. Sev, an American Muslim, saw an opportunity to help Gaza’s emerging surf community by establishing Gaza Surf Relief. Sev quickly collected donations and reached out to Arthur for help. Olsen, an American Christian, went to the Gaza Strip in an attempt to meet with local surfers and establish the first Gaza Surf Club. “After reading the articles about Surfing 4 Peace, I called Arthur and was just like, oh my God, I can’t believe you’re doing this,” Matt recalls. Matt’s father, an American diplomat, had been given the Gaza Strip portfolio in 1991 and moved the family to Tel Aviv, where Matt first met Arthur. As a teenager, most of Matt’s friends were Israeli, but his numerous family friends inside the Gaza Strip offered him a unique perspective on the Arab-Israeli conflict. For the next four years, Matt’s father commuted from Tel Aviv to Gaza City every day. “On one of his first trips, my dad told me that he saw some great surf there, and it always resonated in my head that I wanted to surf in Gaza,” Matt explains. “I studied international relations and participated in outdoor adventure sports in my free time. When I saw that the time was right and the opportunity emerged in Gaza, I started working on a project for a surf club through my non-profit Explore Corps.” Explore Corps is dedicated to implementing unique, youth-focused projects in outdoor education, recreation, and the arts. Matt’s religious background, coupled with his family ties to Gaza, offered him a unique opportunity to serve as the man on the ground in the Strip, not only for his own Gaza Surf Club project, but also for Surfing 4 Peace. “The whole point of the Gaza Surf Club Project, which is a separate entity from Surfing 4 Peace, is to establish a means for Palestinian kids to develop a surf community on their own terms without having specific ties to Israel, which can often politically corrupt a project,” Matt explains. By 2008, Gaza Surf Relief, Explore Corps, and Surfing 4 Peace, together known as the Trinity Project, had built an impressive distribution network. Equipment donated to Gaza Surf Relief was shipped from Santa Monica to Israel via Surfing 4 Peace, where it was passed on to Explore Corps for delivery. Despite bringing in the Peres Center for Peace and international delivery service DHL to assist in the transport process, the 2008 Gaza conflict posed a major hurdle for the motley crew of surfers. That summer, the IDF banned the import of all non-humanitarian items to the Strip. This included surfboards, which meant that only four surfboards were ever delivered. Having been in Gaza before and after the 2008 conflict with Israel, Matt had firsthand experience with the changing political landscape. The Fatah government, which was forced out of power in 2007, was incredibly corrupt. As a result, there was an initial expectation that Hamas would be comparatively less so. But Hamas’ corruption came in a completely different form. “Without education or experience, Hamas built a patronage system where politically connected party members gained influential posts regardless of skill,” Matt says. “This is also true of sports. The Ministry of Youth and Sport is often a big deal in developing countries. There’s a lot of money out there to support sports in the developing world, so it’s a good source of revenue for people who want to create income and there’s very little oversight on the ground.” In Gaza today, all sports are managed by a Hamas-appointed individual with absolute control over all matters relating to any given sport. This individual is also the only party that can accept items donated to Gaza. This is not unprecedented, as a similar system was in place under the previous Fatah government. 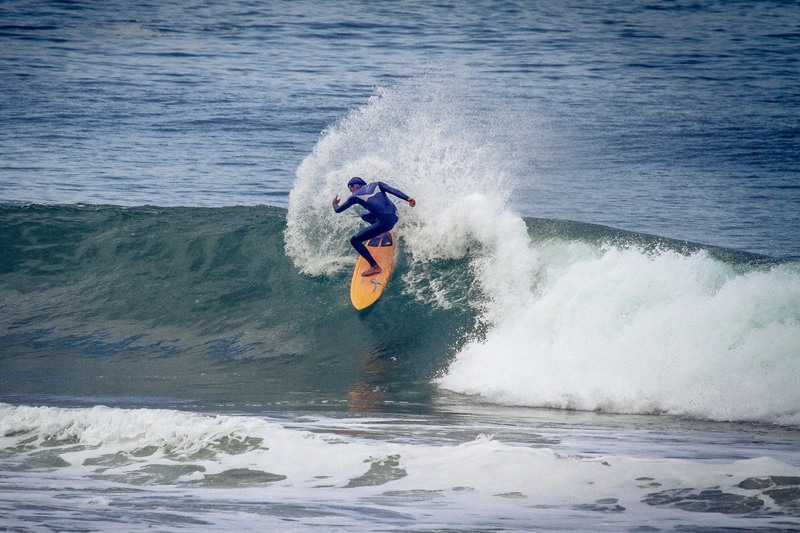 One man, a well-connected Gaza resident, declared himself the area’s surfing czar, and quickly confiscated the 14 boards donated by Surfing 4 Peace in 2007. During subsequent trips to Gaza in 2008-2010, Matt noticed that the surfboards only appeared when international journalists came to publish human interest pieces about the area. It took Matt almost two years to secure permission for the next batch of 24 surfboards, and with the help of the United Nations, the boards were finally delivered in August 2010. In an attempt to prevent the items from being confiscated a second time, Matt arranged for all for them to be delivered directly to the surfers as their personal property. Despite the hardships faced on the ground, the one benefit to the two-year gap in between deliveries was that Matt was able to identify the right candidates for the equipment. “Everyone walked up to me saying that they surf and want a board; for me, I had to identify the surfers’ backgrounds and political perspectives,” Matt explains. “Most of the surfers in Gaza are normal working class kids without political inclinations. Most of them are lifeguards, which allows them the benefit of surfing during their long hours on the beach.” With the 24 brand new surfboards delivered to Gaza, Matt ensured that Gazan surfers would, for the first time, own their own boards. After meeting with the Abu Ghanem family, Matt discovered that the girls were primarily concerned with their lack of appropriate swimwear, due to the conservative Islamic dress code for Gazan women. Seizing the opportunity, Matt worked with the girls to come up with several religiously appropriate swimwear designs. While he continued to develop the Gaza Surfer Girl Project, documentary filmmaker Alexander Klein was preparing a documentary about Surfing 4 Peace titled God Went Surfing with the Devil. Klein traveled to the region in 2008 to meet Arthur and Matt in order to chronicle their efforts. The film premiered at the California Surf Festival in October 2010 and then toured the United States. At a showing in New York, Matt held a question and answer session where he explained the Gaza Surfer Girl Project. Hearing about the female surfers encouraged audience member Shany Cohen, a fashion student at the Parsons School of Design, to get involved with the project, turning Islam-appropriate swimwear into a reality. Following media coverage of the project, the Quiksilver Foundation and the Wahine Project partnered to assemble care packages for the Abu Ghanem girls, which included Islam-friendly wetsuits, accessories, and several surfboards. While the surfing equipment provided the girls with everything they needed, personalized letters from staff at the Wahine Project—established to provide girls with surfing resources—offered words of encouragement to Gaza’s newest surf community. During a meeting in Tel Aviv several months later, they discussed the organization’s growing needs and raised the idea of creating a European sister organization to arrange events with participants from the Middle East who would not have any other opportunity to meet. Shortly thereafter, Samuel helped found the French NGO Surfer Pour La Paix. For him, the goal of the European group was to launch a youth exchange to organize trips for young surfers from all Mediterranean countries and their diasporas. The organization’s first event, the September 2014 Surfing 4 Peace Summit, was held in Marseille and Biarritz, France and featured 22 different surfers from eight countries, including Turkey, Lebanon, Israel, the Palestinian territories, Algeria, Morocco, France, and Italy. The eight-day event commenced on September 21—the United Nations’ International Day of Peace—and featured a series of paddle-outs and surf sessions, as well as several dialogues and parties during which Samuel hoped the participants could lay the foundations for cultural exchange. Since then, two more surf trips were organized in April and October 2015 in Brazil and France. While this initiative is running smoothly, the Gaza Surf Club has faced continuing problems with local officials. Hamas oversees all NGO activity in the Gaza Strip and has refused to register the organization unless it can appoint an official of its choosing to join the club’s Board of Directors. While Matt had plans to build a clubhouse for the group this winter, he’s unsure whether it will happen. “How do I get what I want without speaking with Hamas? Everything is controlled by them, but I can’t ever communicate with them,” he laments. In Empire of Waves: A Political History of Surfing, Scott Laderman explains that while none of these cross-cultural surfing efforts will fundamentally remake the politics of the Middle East, the existence of groups like Surfing 4 Peace demonstrate the emergence of what Irish scholar Stephen Boyd calls a “postnationalist wave” in surfing; one in which surfers have attempted to form a global fraternity that transcends national, political, or religious divides.